1. Boil 1/4 cup of your favourite rice. 2. Chop up some tomato, and make a quick guacamole with some mashed up avocado and salt, and maybe lemon juice. margarine. Cook for 5-10 minutes on medium heat. After awhile once it is cooked, add some water and mashed it up with a hand masher. (a fork could maybe do) Add water bit by bit. 3. Once mashed up, fold in the cooked rice. 4. Take a wrap and layer on your black bean/rice mixture. 5. Put guacamole on top, tomatoes, and sour cream. 7. Fry in a pan on both sides. I cook the side with the opening first to seal it shut. 1. 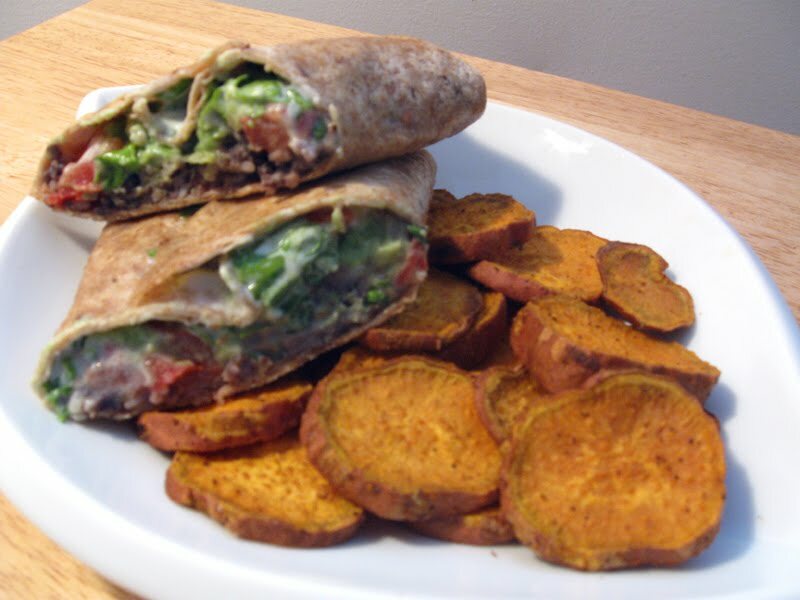 Slice sweet potato into discs. 2. Toss with 1 tablespoon oil, 1/4 chili pepper (if you want spicey chips), and a dash of salt and pepper. 3. Put in oven at 400 degrees for 20 minutes. Consider broiling at the end for 5 minutes for more crispyness.